Music of the Month For a contribution of 20.00 a month (28.00 outside of the US), I'll be sending you a recording from somewhere interesting, each and every month. Some months you will have a choice, some months it will be a surprise, and once in a while, there will be an extra bonus surprise as well. Check out other ways to donate at The Rent Party. 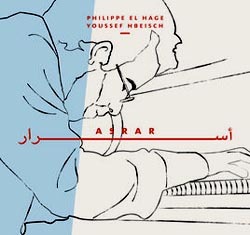 My July 2018 pick for Music of the Month is a collaboration between the Lebanese born pianist Philippe El Hage and Palestinian percussionist Youssef Hbeisch. On Asrar, the two artists compose and improvise around each other in a way that is spotaneous, thoughtful and full of energy. They are joined on some tracks by singer Houry Dora Apartian-Friedli, flautist Ramy Maalouf and on one track by bassist Ognjen Beader. Born in Byblos in 1979, Philippe began studying music in Lebanon. In 2000, he obtained a degree (DEUG) in French Literature from Saint Joseph University (USJ) in Beirut before moving to Paris to complete his piano studies at the Boulogne Billancourt Conservatory. He followed advanced courses for three years at the Regional National Conservatory (CNR) of the city of Rueil-Malmaison under Chantale Riou, obtaining the First Prize in Piano (Gold Medal). In May 2005, thanks to his piano improvisations, he is nominated for the Paris Young Talents 2005 Contest organized by the city of Paris. After two years of advanced Piano Jazz courses at the Gabriel Fauré Conservatory under Francois POPINEAU, Philippe El Hage begins performing in Lebanon, France and Italy in concerts of classical music and improvisation. In September 2007, El Hage releases his first album, Byblos, which he recorded in France. Many other recordings followed in many different styles, leading to this 2018 release. These recordings were donated by the artists so your subscription and purchase all goes to support the magazine and radio programs. We thank them all for their generous support.